Trigger warning/content: Ableism, violence, murder, torture, abuse of disabled people, electric shock, aversives. Autistic and disabled activists, as well as our allies, have for years criticized Autism Speaks' long history of dehumanizing rhetoric about autistic people, irresponsible financial practices, and unconscionable claim to represent autistic people without including any autistic people in their leadership — in direct contradiction to the principles of the disability rights movement. I have written numerous times on the myriad of reasons why autistic people, writ large, not only decline to support Autism Speaks but also actively condemn their goals and practices. Given Autism Speaks' history of damaging PSAs that exploit autistic people and our families, as well as their continual refusal to meaningfully include autistic people throughout their leadership and decision-making process, I am rarely shocked when new information arises about their projects and programs. I was not shocked at their latest PSA, an over twenty-minute-long mini documentary ostensibly about non-speaking autistic people who type to communicate, but which in reality faced sharp criticism from high-profile non-speaking autistic Amy Sequenzia, who types herself. I was not shocked at their announcement of a policy summit in Washington DC this week that will in all likelihood ignore the concerns of real autistic people about education, employment, housing, healthcare, or community living. I was not shocked (though I was deeply saddened) to read founder Suzanne Wright's message yesterday in advance of that policy summit, which once again resorted to fear-mongering language like epidemic and national health crisis, to objectify autistic people as burdens on their families or tragedies for society. 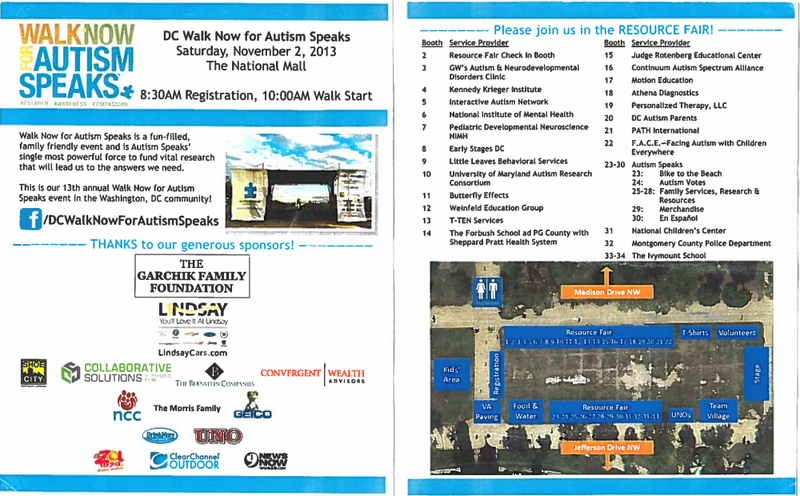 But I was shocked and profoundly disturbed by the revelation that at Autism Speaks' Walk Now for Autism in Washington DC, the city where I live, they chose to host and feature the Judge Rotenberg Center as one of their exhibitors at a resource fair. Autism Speaks featured the Judge Rotenberg Center as a resource for autistic people and their families. For those who may not be regular readers of Autistic Hoya, let me elaborate on the history of the Judge Rotenberg Center. The JRC, formerly known as the Behavior Research Institute, was originally founded in 1971 by Harvard-educated psychologist Matthew Israel, who studied behaviorism under B. F. Skinner. Israel opened shop in California, taking in students with significant developmental, neurological, and behavioral disabilities with a no-expulsion, no-rejection policy. His methodology of treatment was predicated on techniques called aversive interventions — slaps, forced inhalation of ammonia, food deprivation, sleep deprivation, prolonged restraint, deep-muscle pinches intended to inflict maximum pain, and long-term seclusion. One of the more disturbing practices that Israel favors is called "behavior rehearsal lessons," in which students are coerced into producing unwanted behaviors solely for the purpose of subsequently punishing them. Essentially, aversive interventions operate on the same philosophy that some people apply to animals — if you pair an unwanted behavior with a painful stimulus, the unwanted behavior will go away. Except in California, one of Israel's students died as a result of his "treatment" methods. The BRI was forced to relocate, and Israel settled in Rhode Island, where his abusive practices continued. In the early 1990's, Israel had a brilliant epiphany — what if he were to use electric shock as an aversive? Rhode Island's regulatory agency refused to permit the BRI to subject its residents to electric shock punishments, and so Israel moved the facility once again to Massachusetts, where it has remained ever since. The BRI invented their own device, known as the graduated electronic decelator, which is intentionally designed to be more powerful and more painful than a police taser. Students are forced to wear electrodes attached to various parts of their bodies, and whenever they engage in any unwanted behavior (anything from head-banging to flapping their hands to getting out of their seat without permission), staff press a button that causes an electric shock. When the state of Massachusetts attempted to end this barbaric practice, Israel sued the regulating agency. When he prevailed, forcing the then-Commissioner of Mental Retardation to resign, he renamed the facility after the judge who oversaw the agreement — Ernest Rotenberg. At least six students with disabilities have died at the JRC either directly or indirectly because of the torture inflicted upon them in the name of treatment. The former and current U.N. Special Rapporteurs on Torture, Manfred Nowak and Juan E. Méndez, have condemned the JRC's practices as torture. The U.S. Department of Justice's civil rights division has been investigating the JRC since around the time that footage of the JRC's shock treatment (link has a photosensitive epilepsy warning in addition to the trigger warning for torture) was played in open court during a civil lawsuit against the facility. The JRC is the only facility in the entire United States that uses electric shock as punishment on disabled people — a form of abuse that would readily lead to public outrage if used on convicted prisoners or animals, but that remains largely unquestioned when called "treatment" and used on disabled people instead. People with disabilities, family members, and community advocates have been calling for an end to the JRC's abuses for decades. I have compiled a long list of links to articles, formal reports, court documents, and videos documenting the JRC's brutal practices. Of the myriad of abuses that occur in institutional settings, the JRC's are certainly among the worst. And yet Autism Speaks had the gall to include the JRC as a "service provider" in their resource fair at the DC Walk Now for Autism. This is the organization that is hosting a national policy and action summit to develop a national plan on autism in Washington DC this week. An organization that explicitly and unabashedly partnered itself with the Judge Rotenberg Center. Autism Speaks' history of excluding autistic people from leadership (up through the utter absence of any autistic people whatsoever on their board in the history of the organization's existence) ought to be troubling already — and their repeated insistence on justifications for violence against autistic people murdered by family members or caregivers shocking to the conscience. This alliance between Autism Speaks and the Judge Rotenberg Center is outrageous beyond belief. I urge policymakers and community members interested in supporting autistic people and our families to support disability rights organizations led by disabled people. It is not possible in good conscience to lend one's support to an organization that not merely siphons money away from local communities and into research that does not benefit autistic people, but actively aligns itself with a facility with a widely publicized, well-documented history of brutal abuse and torture of people with disabilities. Those of us who are autistic deserve a national plan on autism developed with us included at the table at every step of the way. We deserve a national plan on autism that seeks to benefit us rather than harm us. We deserve a national plan on autism that condemns abuses such as those at the Judge Rotenberg Center rather than encourages complacency with those practices, let alone directly endorses them. We deserve a national plan on autism that moves away from the language of pity, fear, and tragedy, and toward achieving equality, access, and inclusion in our communities. Autism Speaks — it is well past time for you to listen. Image description: Two scanned images of a hand-held printed card are side by side. The background of both is white. The front side bears the Walk Now for Autism Speaks logo, with the motto, Research Awareness, Compassion, beside the event information — DC Walk Now for Autism Speaks Saturday November 2, 2013 The National Mall, 8:30AM Registration, 10:00AM Walk Start. Then there is more text, "Walk Now for Autism Speaks is a fun-filled, family friendly event and is Autism Speaks' single most powerful force to fund vital research that will lead us to the answers we need. This is our 13th annual Walk Now for Autism Speaks event in the Washington, DC community!" Then a picture of a tend with a big Autism Speaks banner. Then "thanks to our generous sponsors" followed by a variety of foundation and corporate logos. The back side of the card bears a header that says "Please join us in the RESOURCE Fair!" and has two columns under that, one with booth number, and one labeled Service Provider. There are 34 booths numbered, belonging to various autism-related organizations, centers, or service providers. Number 15, which is at the top of the second column, is the Judge Rotenberg Educational Center. Beneath the list is a satellite image of the walk area with various stations labeled. I'm paradoxically both shocked and not the least bit surprised that they teamed up. It makes sense that, in both their twisted logics, they'd see each other as allies. The depths to which these people can sink... Maybe Autism $peaks is being bribed or blackmailed into this somehow. I know they aren't, but I don't want to believe one of the biggest autism organizations with the best PR is supporting torture. I've always pictured A$ as well-intentioned people with terrifying goals but reasonable methods, not as a bunch of people willing to hurt children in ways that would be illegal to do to a prisoner of war. I can't believe that people who previously were only known for making really bad statements are teaming up with these card-carrying villains. There is no reason to bribe or blackmail Autism Speaks. They took the foreground and represent the views of parents, professionals and some people with autism who feel isolated, rejected and abandoned. Paradoxically, some of the biggest causes of that sense of alienation are in the medical profession, which is the biggest beneficiary of the Autism Speaks alignment. I don't actually think A$ is actually being coerced, but I want to think that, because I really don't want to see what these guys can accomplish together. How about if Autism Speaks get some of that shock treatment. Come on put your money where your mouth is. If you going to support it then lets shock you over and over! Even the UN condemned it, and NORMALLY, the only thing they condemn is Israel, the Jewish State, for self defense, which they'd condemn NO OTHER NATION for! You honestly believe electroshock therapy is "good" for anyone? Please shut your mouth, go away and go back to 1450 where you clearly belong. CC, if this person is actually a JRC victim, which I doubt, ze clearly has Stockholm syndrome and is feeling good things about zir abuser, in which case zir statements are still inaccurate but more understandable. However, I do not think any JRC student would condone the institution's actions, unless the portion of the institution using aversives is a small part of the institution. If this is in fact the case, I ask that Anonymous cite sources showing that most JRC students are not tortured. It tortures people. No alleged good it does can outweigh its institutionalised neglect and torture. If I weren't committed against the death penalty, I'd be demanding it for these sadistic murderers. Since you've been there, your opinion is important. Could you elaborate? Just a note as well that what JRC practices is NOT electroshock therapy. ACTUAL electroconvulsive therapy is used under controlled medical conditions, under anesthesia, on adults who have given informed consent, and while it has significant risks and side effects, it has legitimate uses (for severe and otherwise intractable depression, for instance). That's not what the JRC is doing. They're using non-FDA approved electric shock devices on minors for aversive purposes. That's torment, not treatment. I'm a Special Needs & Gifted Needs Educator who has previously worked as a Special & Gifted Needs Coordinator, taught specialized project-based classes, taught/teaches in inclusive classes & partially pull-out support (small groups w/mixed special needs along w/like minded peers) & tutors students. My specialty is focused on working w/ children to young adults who have neurodevelopmental disorders &/or chemical imbalances, mood disorders, psychiatric conditions, behavioural challenges & environmental factors, along w/their parents, guardians & in locus parentous. I've worked in many settings as a teacher & therapist w/ a wide spectrum of abilities & challenges & communication skills (& incidentally most of my professional employment has been in NYC & Boston metro area). In all of the places & situations I've encountered during the 20+ yrs as a professional (& my own neurological/medical conditions& neurodevelopmental disorder that I have), I have *NEVER* encountered such horrid conditions as JRC. I interviewed for a teaching position so I could see JRC in person. It's as horrible as it's been potrayed & the HR person was completely oblivious to the ramifications of the negative reinforcements/stimuli & 'positive' stimuli. She even offered me to try the GED during the interview. Needless to say, I didn't take up her offer (I have a severe Migraine Disorder & get seizures & tactile sensitive, so that's the last thing I need). Research studies on adversives & outcomes. Even B.F. Skinner eventually redacted his hypothesis & determined that the outcome did not eradicate negative behaviour permanently; rather, continued exposure causes PTSD in animals (let alone humans) & creates dependence on the aversives (which is called 'institutionalisation' in the professional world). Chavisory is correct... What JRC does is called "G.E.D." -- a devices that causes shocks on the body by putting 2 or more electrodes on the body (I was told that it could be up to 10 on a child) & emits painful shocks byusing a contraption put in a fanny pack or backpack. The teacher pushes a button if a student exhibits a 'negative behaviour'. Sometimes, a teacher can be so anxious that s/he presses the wrong button & zaps the wrong child. If another child reacts to the student being shocked, they can be punished as well. If any of you have neuropathy, paresthesias or dysthesias, it's like that, but more intense. ECT is completely different (see above). PTSD can cause an individual to develop Stockholm Syndrome. You can google "Why I Stayed" to see victims & survivors of abuse & the psychology behind someone who has remained in an abusive environment. (Btw, I'm not the Anon who "claims" to be a student. Innocent victims don't realize they are victims because they have been brainwashed and conditioned by the status quo to advocate the status quo. They, themselves, then advocate the status quo in ignorance. They observe their trusted love ones advocate the status quo, and it strengthens their misconception. But their trusted loved ones have only been deceived and misguided themselves. Auschwitz must have been booked, so JRC's 2nd best choice. Don't EVER mention Auschwitz in a statement like that!!! I am Jewish and take GREAT offense to that! I had family that died in the camps...... How dare you!!! I am Jewish, too, but I am able to see the suffering and discrimination visited on other groups as well. Hopefully it doesn't descend to the level of what was perpetrated against us then. Thanks, "Anonymous," for having the courage to stick-up for other people who are suffering. Thank you for your closed-mindedness for relegating such a horrible disaster to the shadows or better yet, swept under the rug. How can we learn from the horrific lessons mankind is capable of doing if we don't acknowledge (censored by "Anonymous," who thinks HIS suffering is worse than anyone else)? Wouldn't it be interesting to know if I am Autistic AND had close Jewish family? I don't think your sensibilities could handle the answer. Please, go back to trolling in the shadows and leave the call-to-action for those brave enough to post our names and be accountable for our actions. You, anonymous, dishonor those who were tortured and died at Auschwitz by not wanting to reference it for future change. You, Anonymous, dishonor those who were tortured and died at Auschwitz by not wanting to reference the past to create future change. You just tried to tell someone how they should feel and behave, which is gross, Janice Sorenson. David Kot- no, it wouldn't be that interesting to know that.. It's awful what these people are doing, but there's no GAS CHAMBERS or work camps, Auschwitz is much worse, I met somebody who SURVIVED the camps, I'm sure that JRC, despite being SO BAD, that even the UN, who normally has a super focus on condemning Israel only-condemned it, is not as bad as Auschwitz! Thank you for continuing to share this distressing information, and best of luck with the protest today. Actually, I don't make comparisons to Nazi tactics, ever. You're right, it's a disgusting practice. But seriously, reading the "call to Action" by Autism Speaks, with its language of tragedy and hopelessness, the suggestion that autistic people are a burden to themselves and others? The logical next step was to promote euthanasia, and some parents do exactly that because of this type of rhetoric. This stuff is poisonous and disgusting, and feeds off of fear, built up in parents who are taught to think of their children as freaks.And the torture chamber designed to make people act "normal". That's an atrocity in the name of "help" just as the "call to Action" is a statement about the tragedy of the "unfit" among "Great Americans" (ironic, given how many great Americans are, and were, Autistic) disguised as advocacy. Um, yeah....I try to avoid Nazi comparisons wherever possible, because they are usually unwarranted and more likely to turn into a distraction rather than prove any point. thank you for writing this and sharing information about the JRC. i had heard of it but never seen the video footage. as someone in the mental health field, it's utterly appalling that anyone could deem that 'treatment' or anything other than torture. thank you for sharing. i had heard of the JRC before but not seen the footage. as someone in the mental health community, it is utterly appalling that anyone could think that was 'treatment' or anything other than torture. The appalling torture at the JRC is a direct result of the dehumanization of autistics and panic that autistic children will be distinguishable from their peers. Hi all. My guesws is honestly they had an "Expo Coordinator" that booked organizations and that person had ZERO idea who they were bringing to the table. Ive had a similar job book expo tables and when youre young and an agency calls and says "we help autism" you say OH Boy where do I sign?! Oh please. Go look at the video (if you can find it!) made by board members of Autism Speaks where they talk about how autistic children destroy the lives of their parents. Judge Rottenberg Center is not that much of a stretch for the type of sadistic board members of Autism Speaks. The video was taken down because it was so mean spirited and offensive. SHAME on the monster who created that despicable attack of autistic people! Well articulated. I really appreciate the comprehensive history of the JRC. I did not know that!!! Sadly the sheer hypcocrisy of Autism Speaks is not surprising. They condemn out of one side of their mouth yet then acknowledge them as a service provider. Anything for money and attention. That's all it seems to be about with that disgusting organization. When are people going to wake up and stop walking and raising money for these creeps? Maybe they'll do a Cuban Missile Crisis and embarrass themselves straight to hell. I suspected something like this, a couple of weeks ago when someone from JRC left a voicemail for Autism Network International, saying they wanted "reach out to different advocacy groups." I wondered, where would they get the idea of connecting with *advocacy* groups? Then I wondered, maybe Autism Speaks gave them that idea? No surprise. As a non-JRC survivor of electric shock therapy, it's frustrating for me to read these discussions because more often than not, they are dominated by people who have never actually experienced electric shock therapy. I would really appreciate people letting JRC survivors take the lead in this discussion, followed by survivors of any kind of electric shock, then lastly, by everyone else. In general, having discussion center the people it's about yields a more successful discourse. JRC isn't using actual electric shock therapy for conditions like severe long term depression. They are literally using non-FDA approved electric devices that do not work in the same way that electric shock therapy is used. There have been survivors that have spoken out against this sort of "treatment" that's actually torture. Anon, you must not have even looked at the side bar here. On this very blog you can read a letter written by a survivor of this facility. The shocks themselves aren't even the extent of the torture- they use extreme restraint on people who do not need it, and made her wear a diaper when she hasn't even needed one since she was a baby. Anon, on the sidebar you can see that this very blog has a post featuring a letter written by a survivor of this facility. Some of the content is very triggering and upsetting. The shocks are not therapy but punishment, and not performed safely. The woman has a scar on her stomach from being burned by the device. And shocks aren't the only abuse. They restrain people who don't need it, withhold food, and made her wear a diaper when she has not needed one since infancy. Gotta laugh (bitterly) at the name 'Judge Rotenberg Educational Center'. The only thing they're educating anybody on at that place is how to acquire severe PTSD.